–‘Summer Slam’ is one of the WWE’s ‘Big Four’ PPV events. –This is the 31st Summer Slam event and will be held at Barclays Center in Brooklyn, NY for the fourth consecutive year. Summer Slam is one of the WWE’s ‘Big Four’ PPV events along with Royal Rumble, Survivor Series and Wrestlemania. It’s either the second or third biggest event of the year behind only Wrestlemania and possibly the Royal Rumble. The first Summer Slam was held at Madison Square Garden in 1988 headlined by a tag team match between ‘The Mega Powers’ (Hulk Hogan and Randy Savage) vs. ‘The Mega Bucks’ (who were unfortunately not the Young Bucks but Ted DiBiase and Andre the Giant). Jesse ‘The Body’ Ventura was the special referee for that match. The main event of last year’s Summer Slam was considerably better than the ‘Mega v. Mega’ tag team trainwreck at the first incarnation of the event. At Summer Slam 2017 the main event featured Brock Lesnar defending his Universal Championship in a ‘Fatal 4-Way’ against Braun Strowman, Roman Reigns and Samoa Joe. The match earned a 4 3/4 star rating from Dave Meltzer. It’s very likely that Lesnar’s Universal Title defense will once again go on as the main event, this time in a singles match against Roman Reigns. In the past few years, the WWE has made Brooklyn’s Barclays Center arena the de facto home of the Summer Slam event. This will be the fourth consecutive Summer Slam held at the home of the NBA New Jersey Nets and (for now at least) the NHL New York Islanders. 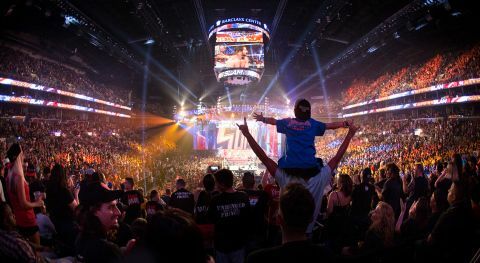 It should be noted that prior to the run of Summer Slam shows in Brooklyn the event called Los Angeles’ Staples Center home for six consecutive years from 2009 to 2014. Since we’re still three weeks out from Summer Slam 2018 there’s every reason to think that this card is subject to change. For all we know, it could end up being a ‘Turkey on a Pole Match‘ for the Universal Title. In light of the near certainty for changes and addition to this card we’ll call these our ‘opening odds’. As we get closer to the event we’ll add some props and update the numbers on every match on the card.